Rules Guy: Why aren’t PGA Tour players penalized for ‘backstopping’? The Rules of Golf are tricky! Thankfully, we’ve got the guru. Our Rules Guy knows the book front to back. Got a question? He’s got all the answers. My nine-year-old granddaughter took a swing with the intention of hitting her ball, but whiffed. The swing’s momentum was so great that it carried the club and her little body around 360 degrees, such that she then unintentionally did hit the ball. Has she stumbled upon a new way by which one swing could cost you two strokes, or might this be legal, since it was one continuous motion? — DAVID MACZKO, CAPE COD, MASS. This sounds positively adorable, David, so much so that it feels Scrooge-like to note that, under Rule 18-2, it is indeed a one-stroke penalty and the ball must be returned to its original spot, since it is no longer a stroke once the player no longer intends to hit the ball. Whether you share this knowledge with your granddaughter is up to you; either way, treat her to not one but two scoops of ice cream after your next round together. We need all the young golfers we can get! It has become prevalent on the PGA Tour for a player to leave his ball that is very near the hole unmarked while another player chips up. It seems obvious that this is to aid the other player, and that they have agreed to do so. How are they getting around Rule 22? Does the Tour have its own rule for this? — RICK DURYEA, LEAGUE CITY, TEXAS “Prevalent” may be overstating the case a bit, but no doubt this situation has reared its head on a few occasions recently. As you note, under Rule 22-1, players in stroke play can’t agree to leave a ball in place to assist another player. But proving there is an agreement — collusion, if you prefer — is no mean feat. (“Seems obvious,” alas, isn’t a legal definition.) No proof of agreement, no Rules issue. That said, in this scenario every player should be vigilant about protecting the field of fellow competitors. If a player thinks his ball may assist another player, or another ball may assist another player, he should lift his ball or request that the other ball be lifted. Backstops are for that other great American pastime, baseball — not for golf. During our recent club championships, the eventual women’s champion was tapping in a putt. The ball hit the cup, bounced back, hit her putter and fell into the hole. The consensus was a total of two strokes, with the ball in the hole. Correct? — BILL DRANGINIS, LITCHFIELD, Conn. Nice to hear that this unfortunate competitor — clearly from the “firm to the back of the cup” school of short putting — didn’t let a bad break halt her march to victory. She has made one stroke and then incurs a one-stroke penalty under Rule 19-2 for the accidental deflection. The ball is holed. Had it not been, the ball would have been played as it lay. 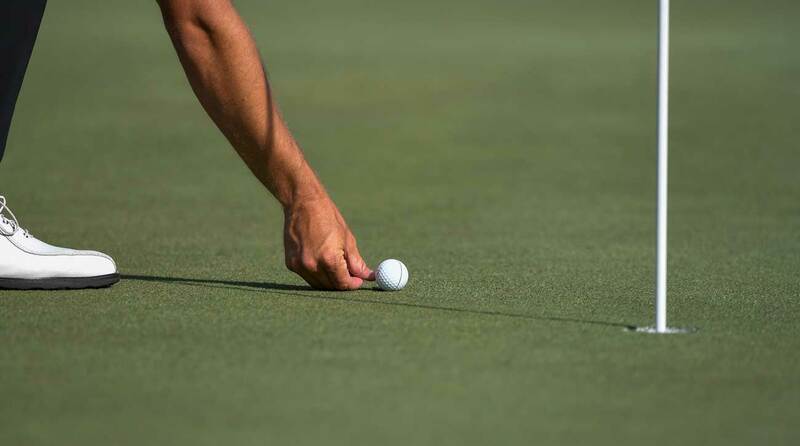 Some PGA Tour players will not always rush to mark their balls like in this photo. Our friend Steve’s ball marker somehow moved from two feet away from the hole to about six feet away without anyone noticing. We agreed to let him putt, without penalty, from the consensus estimate of the original spot. Is this what we should have done? — DON WILLIAMS/WINK KIRKMAN, GREENSBORO, N.C. Gentlemen, the dangers of marking one’s ball with a feather or live insect should be apparent to all (although of course it would be more suspicious had the mark instead moved from six feet to two feet). Regardless, in these scenarios, you indeed replace the ball, without penalty, as near as possible to where it was originally lifted — and then suggest that your buddy mark with a manhole cover going forward. Got a rules question? Of course you do! Whatever it may be, send yours to [email protected] and the question may be answered in an upcoming issue of GOLF. Until then, play by the Rules!